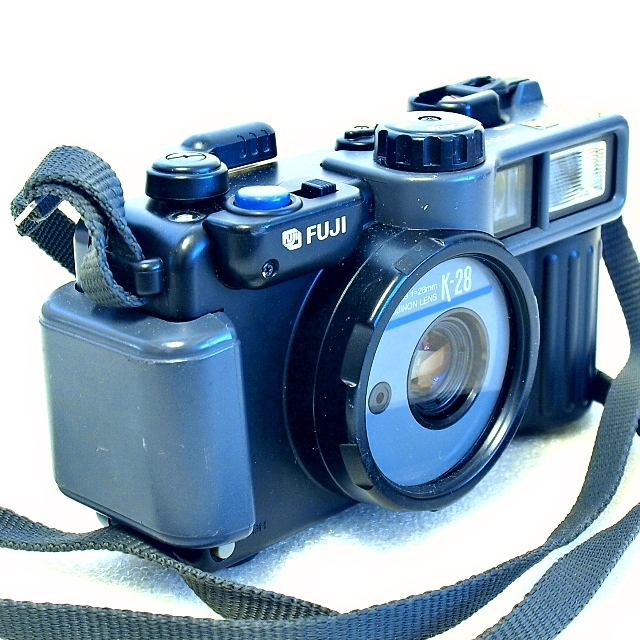 Fuji released the beginning of a series of heavy-duty compact cameras, the Fujica HD-1, in 1979. 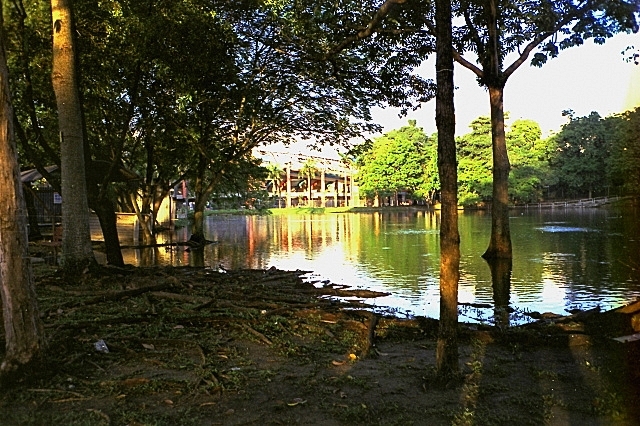 The camera was fitted with a 38mm F2.8 lens encased behind a large protective window. That was the start of a series of weatherproof cameras for use on constructions sites and rough terrain. The series evolved into the HD-S, HD-M, and HD-R, known under the generic name 'Bruiser'. They share some resistance to dust, shock, and moisture. This HD-R, the successor of the HD-S, is waterproof to a depth of 2 meters. 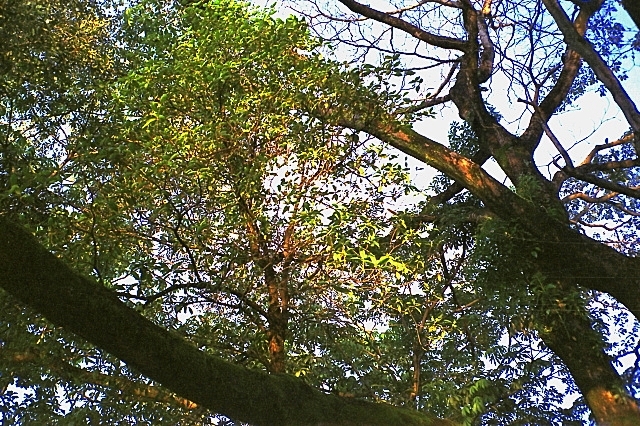 The HD-P has an option for turning the camera into a crop-frame panorama camera. All the models are fitted with the same Fujinon 38mm F2.8 lens and had a large knurled knob on the top to adjust the focus distance. The cameras accept negative or slide film with an ASA speed range from 100 to 400 and are metered by CdS sensors. 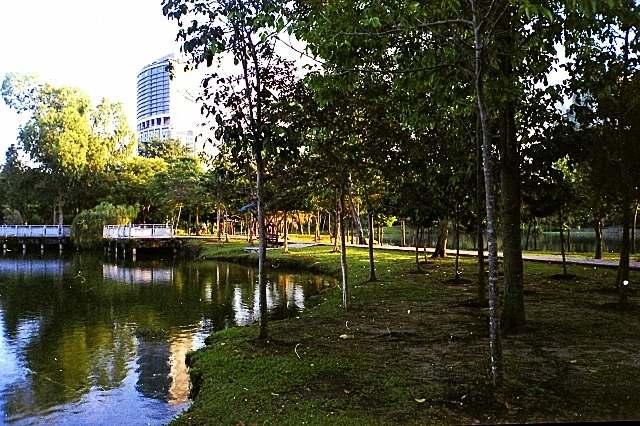 The Fuji K-28, on the other hand, though having similar ruggedized features as the HD series, is fitted with a wider albeit a slower 28mm F3.9 lens. 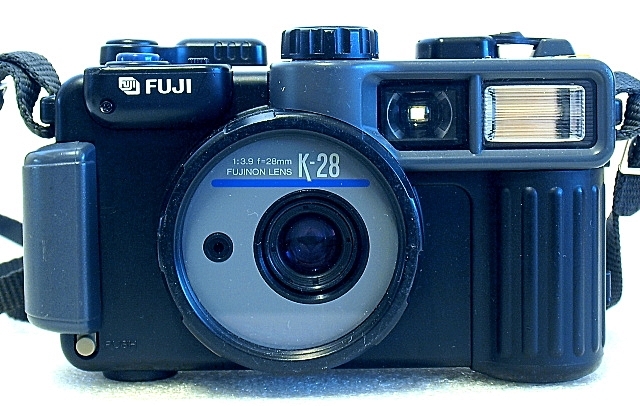 The K-28 is marketed as a construction camera, usable under conditions of a construction site. It is also dust and splash-proof, with all controls sealed against the elements via tight fitting rubber gaskets and secure latching systems. 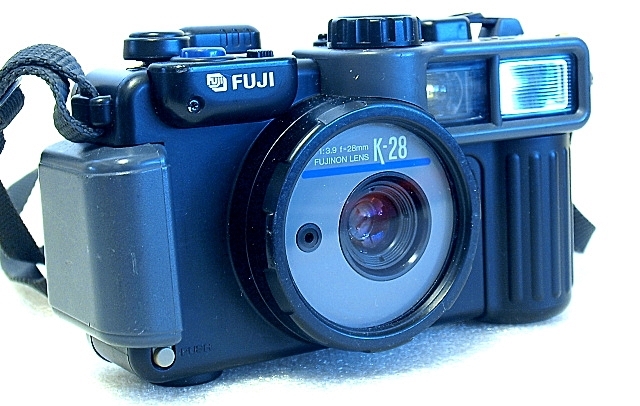 The K-28 was released in 1991 and on its sales package, it is also designated as a compact camera. 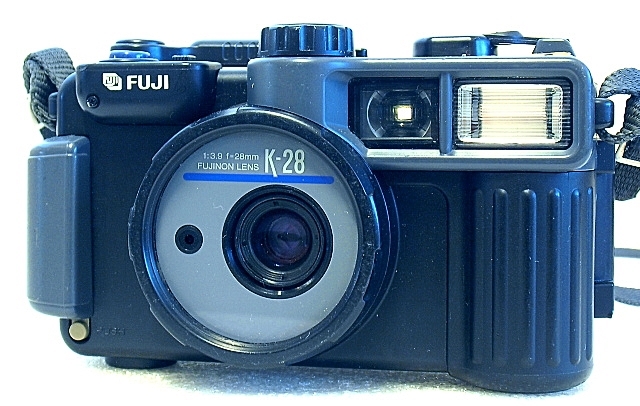 Not much is known about the Fuji K-28, it is quite rare outside of Japan, and just as well not much information about it is available on the web. The K-28 is fitted with a sealed 28mm F3.9 lens with adjustable focusing and auto exposure with a set 1/100th of a second shutter. 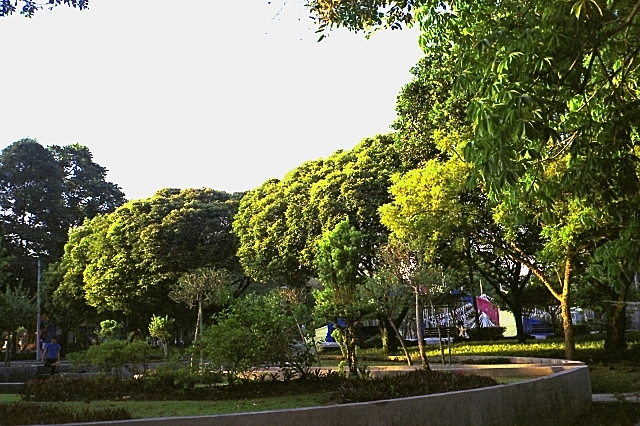 The lens is 5 elements in 5 groups construction, with a minimum focus distance of 0.75 meters. 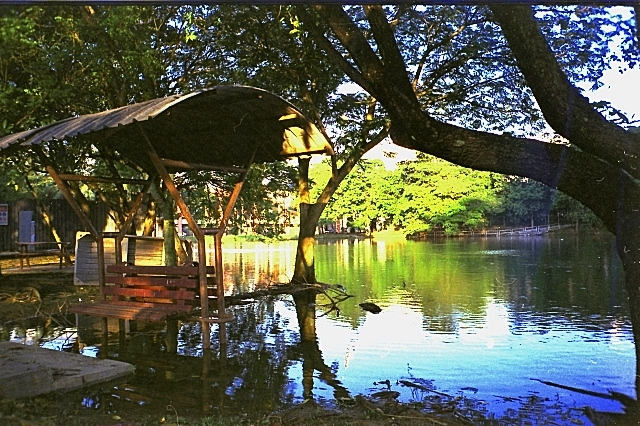 The automatic exposure system automatically recognizes film sensitivities from 100 to 400 ASA. 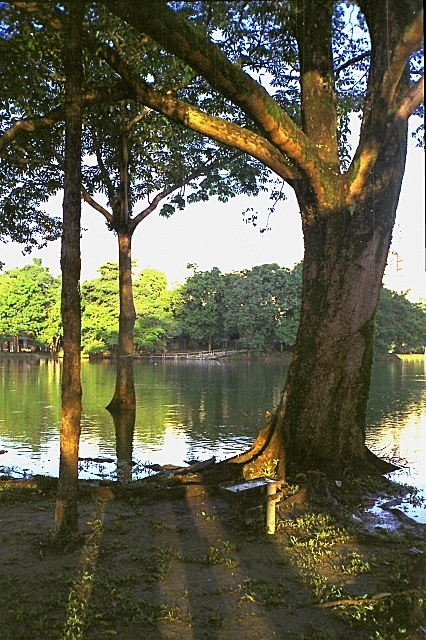 The camera is metered by a CdS sensor located beside the lens. 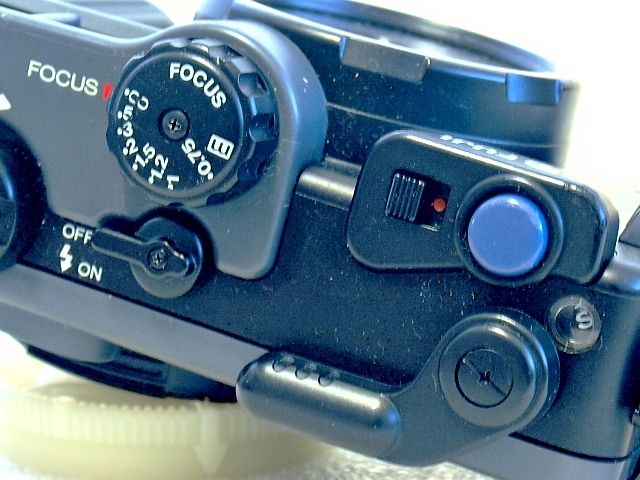 On the top plane of the K-28 are the focusing thumb-wheel and the on/off lever for the flash unit located behind it. To the right are the lockable shutter release button, the film advance lever, and frame counter window. The rewind knurl is on the left of the top plate. The film back is plain except for the film check window. On the back of the top plane are the viewfinder window and the flash ready indicator. On the bottom plate are the rewind release button and the coin-slotted battery chamber screw-on cover. The first of the two AA cells required to power the flash and electronics is slotted slightly offside into the rounded shape of the chamber while the second slots in vertically and directly into the chamber. 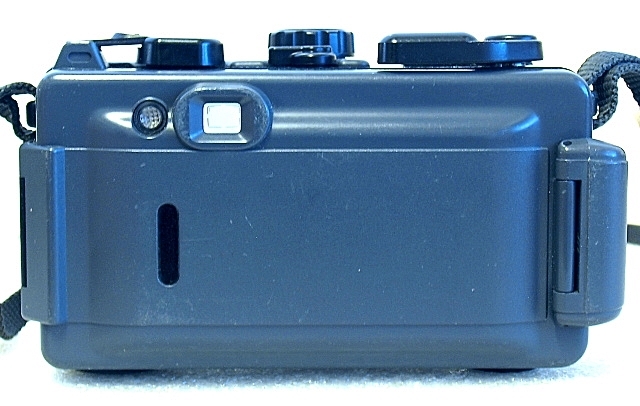 The film back is opened by disengaging the finger grip hump, which is actually the latch mechanism, located on the right side of the camera body. 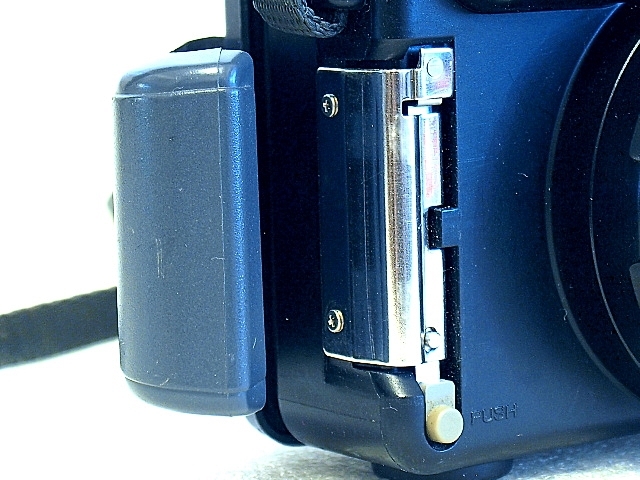 The latch can only be released when the small button located at the bottom of the latch hump, on the front panel of the camera, is pressed. The film box is fairly standard as seen on most 35mm film cameras and loading the film is fairly intuitive. Insert the film tab into the yellow spindle, do the wind and release the shutter to ensure that the film if correctly loaded. 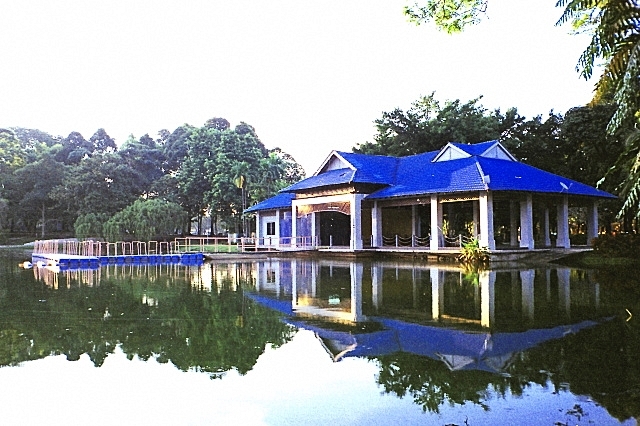 Close the film back, continue with the customary 2-blank shots to forward the film to frame 1. The viewfinder readout is a simple single bright frame line with parallax correction indicators. A red LED lights up above the viewfinder, within the peripheral of your view, to indicate low ambient lighting condition. 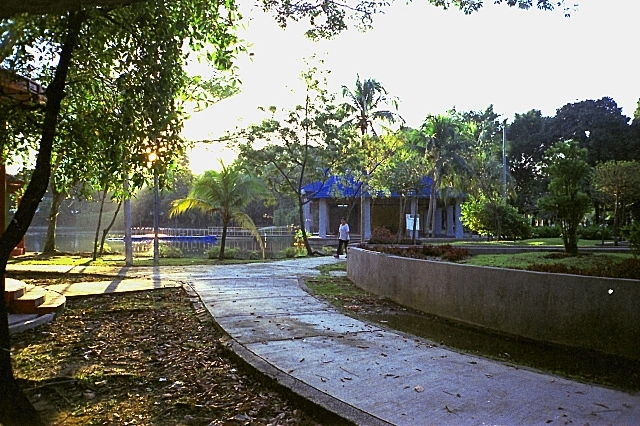 Being a fully manual camera, with manual film wind and rewind, focus zoning, and flash on, the K-28 does takes you a step back from the ease of using autofocus point-and-shoots such as the Konica Genba Kantoku 28WB and Fuji Work Record OP, both of which are also ruggedized and weatherproof cameras built for the construction industry. Without the aid of the autofocus mechanism, but with an F3.9 lens, the Fuji K-28 should be more forgiving when it comes to getting images in focus and may work well with hyperfocal distance zoning technique. While working with adjustable focusing and auto exposure with a set shutter speed of 1/100 second may not sound like the best of choice, the Fuji K-28 is not really short in its capability of capturing, as can be seen with these early examples, sharp and contrasty images. The trick I found about using this camera, as well as similar AE cameras, is to reduce the amount of sky or bright patches of background in the composition to a minimum. This will help to even out the overall exposure on the image. But when it comes the choice 35mm film cameras with a 28mm focal length lens, always a street fantastic, and the chance of getting caught in the rain, or snow, where a knock or two will do your camera no harm, the K-28 may end up as a good proposition. You may also want to get used to the color creatives of the K-28 as unique to your photography style. These images were shot on a roll of expired Fuji Superia 200, post-processed on Olympus Viewer 3 (OV3), and print sharpened on Google NIK Sharpener Pro 3.